This pairing of a grey turtleneck and a pink pleated midi skirt is so easy to create and so comfortable to wear all day long as well! Look at how well this getup is finished off with silver leather pumps. If you're on a mission for a casual yet totaly stylish look, wear a white cropped top and a pink pleated midi skirt. As well as very comfy, these pieces look amazing when paired together. And if you want to instantly up the style ante of your look with one piece, add silver leather pumps to the equation. Try teaming a white and navy horizontal striped long sleeve t-shirt with navy denim overalls, if you want to dress for comfort without looking like a slob. 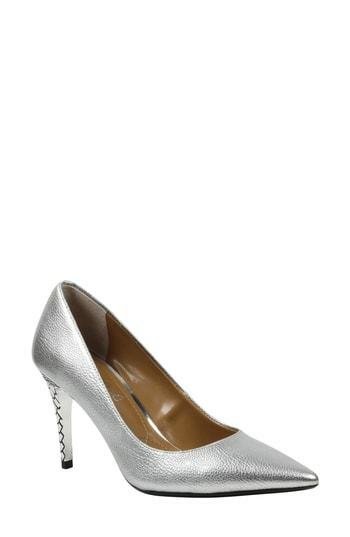 Up the cool of your outfit by wearing silver leather pumps. 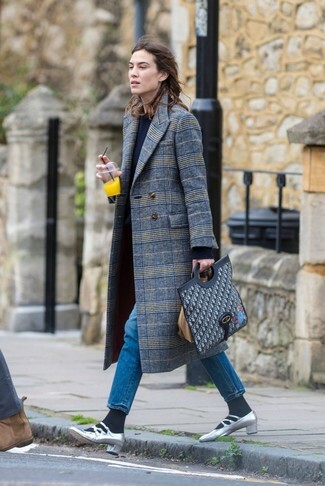 If you're on the lookout for a casual yet totaly chic outfit, rock a grey plaid coat with blue jeans. These two items are totally comfortable and will look stunning together. Elevate this outfit with J. Renee Maressa Pointy Toe Pump. Contrary to what you might believe, looking stylish doesn't require that much effort. Just opt for a white chiffon party dress and you'll look incredibly stylish. Look at how well this look is complemented with silver leather pumps. If you're all about feeling relaxed when it comes to figuring out an outfit, this combination of a mint crew-neck sweater and white ripped jeans is right what you need. Opt for a pair of J. Renee Maressa Pointy Toe Pump from Nordstrom to instantly up the chic factor of any outfit. If you enjoy a more relaxed approach to fashion, why not marry a white long sleeve t-shirt with a silver pleated midi skirt? Rock a pair of silver leather pumps to va-va-voom your outfit. If you're looking for a casual yet stylish getup, make a grey embellished crew-neck sweater and black skinny jeans your outfit choice. As well as totally comfortable, both of these items look great when paired together. Kick up the cool of your getup by finishing off with J. Renee silver leather pumps. 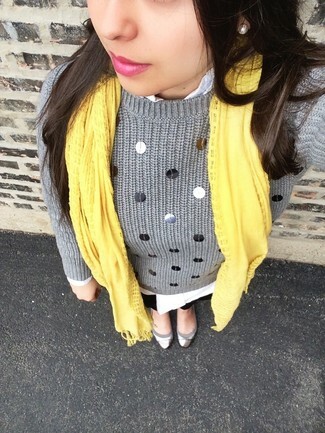 Pair a grey turtleneck with a silver sequin pencil skirt and you'll ooze elegance and refinement. J. Renee Maressa Pointy Toe Pump are a nice choice to complete the look.